Well, this is it. 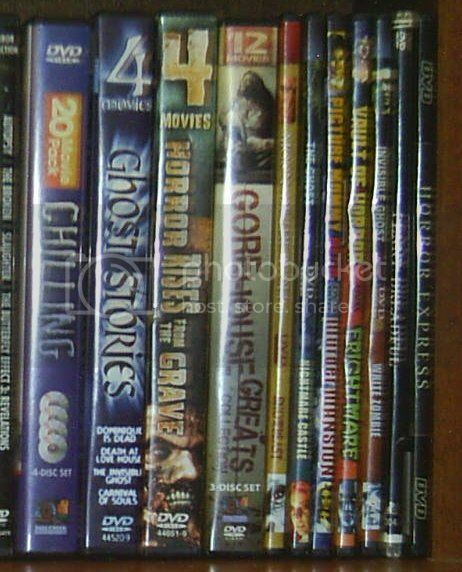 The final part of the last shelf full of my Region 1 horror DVDs has come. Are you sad about it? I know I'm not. It's not the last time that I'll be posting parts of my collection anyway, but I will never, ever, EVER, go through them all like this again. Since I've already made posts about all of my Mill Creek Entertainment packs over the last two years (I have them all, just so you know), it's fortunate that I only have two of them on this shelf and I don't think I ever reviewed the second one. As you can see from the picture on the right, between them I have two old Brentwood (BCI) "4 Movies" packs from FYE which I don't think that I've written anything about either. All the EastWestDVD double-features at the end, I covered last year in my "I bought that for a dollar" bargain DVDs series but I'll still say something about them again because I can. Okay, time to finally get this monkey off my back as I go through to the end of the shelf. I've already got a post about this so I'll just repeat that if you only buy one Mill Creek Entertainment horror multi-pack in your life, this should be the one you get. Nearly all the Public Domain greats are here including "Dementia 13", "The House on Haunted Hill", "The Last Man on Earth", "The Little Shop of Horrors", "Maniac", "Moon of the Wolf", "Night of the Living Dead", "Snowbeast" and "The Terror". If only it had "Carnival of Souls", "Nosferatu" and "City of the Dead", you wouldn't need to buy any more. You can download those or watch them on YouTube for free anyway. I'm a big supporter of Mill Creek Entertainment's products so I recommend that you treat yourself to at least a 50 pack sometime as well. Wal-mart and Target always have good deals on them. "Dominique Is Dead", "Death at Love House", "The Invisible Ghost", and "Carnival of Souls". Basically, another four VHS transfers of Public Domain movies. The weakest link is "The Invisible Ghost" although even that has a better than usual performance by Bela Lugosi. 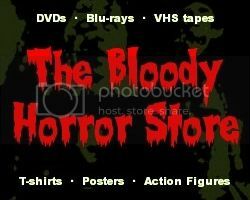 "Horror Rises from the Tomb", "Zombie Flesh Eaters", "Zombie Hell House", and "Night of the Ghoul". Quite a mixture of quality here with the standouts being "The House by the Cemetery" (aka "Zombie Hell House") in widescreen and "The Ghoul" (aka "Night of the Ghoul") for everyone who loves British horror. If you've never seen "The Ghoul", the recent remake of "The Wolfman" borrowed heavily from it. The weakest link is Paul Naschy's "Horror Rises from the Tomb" but it's still entertaining. "Blood Mania", "Blood of Dracula's Castle", "Brain Twisters", "The Devil's Hand", "The Madmen of Mandoras", "Nightmare in Wax", "Prime Evil", "Satan's Slave", "Stanley", "Terrified", "Terror", and "Trip with the Teacher". Only $5 from Wal-mart and worth every penny since I still haven't watched all these movies. Standouts are "Trip with the Teacher" which is a lot like "The Last House on the Left", and "Satan's Slave" for all those people who think that "House of the Devil" was so original. Depending on what you are in the mood for, there aren't really any weak links apart from the quality of the transfers. Very much a staple of the Public Domain DVD distributors. If you collect PD discs, you'll have these two films a dozen times. At least these are in colour. All my EastWest DVDs came from a dollar supermarket which no longer exists but you'll find them in most dollar stores. A couple of Italian Barbara Steele movies. Not bad either. These are thrillers not horrors although they are dated enough to be awful to watch. One good one and one which makes you wonder what the Hell you are watching. I won't say which is which, you can decide that for yourself. An obligatory Bela Lugosi double bill which I don't particularly care for. Not the Rachel Miner one from the "After Dark Horrorfest" but the far superior short starring Emily Vaughan. I bought my copy through eBay from the director, Bryan Norton, who signed it before sending it to me. I don't know for sure, but I expect he's still selling them. This is the Digiview version which I found in Dollar Tree. I have a slightly better version in one of my Mill Creek packs. That's it. That's really it! Such an anticlimax, but at least I'm free to watch some more horror films and do some real reviews again now. I'm going to take a break now since I'm expecting another day with a temperature of 95 degrees and tomorrow is a big shopping day (I mean "holiday") which I intend to make the most of.